BALTIMORE (Stockpickr) -- It was a best-case scenario for stocks. Or was it? Markets didn't react quite like investors had hoped to news that the Fed would be keeping interest rates unchanged over economic concerns. By the time yesterday's closing bell rang, the big S&P 500 had given back all of its intraday gains, ending the session 26 basis points in the red. Almost two-thirds of the stocks in the big index ended lower than they started Thursday when all was said and done. No, it wasn't a horrible trading session by any stretch -- but it was a reminder that the price action for the rest of 2015 isn't guaranteed either, now that the rate decision is set. Stock selection still matters this fall, and making sure you don't own the under-performers is every bit as important as making sure you own the outperformers. To find out which stocks are showing red flags ahead, we're turning to the charts for a technical look at five big "toxic stocks" you don't want to own. So, without further ado, let's take a look at five "toxic stocks" to sell. 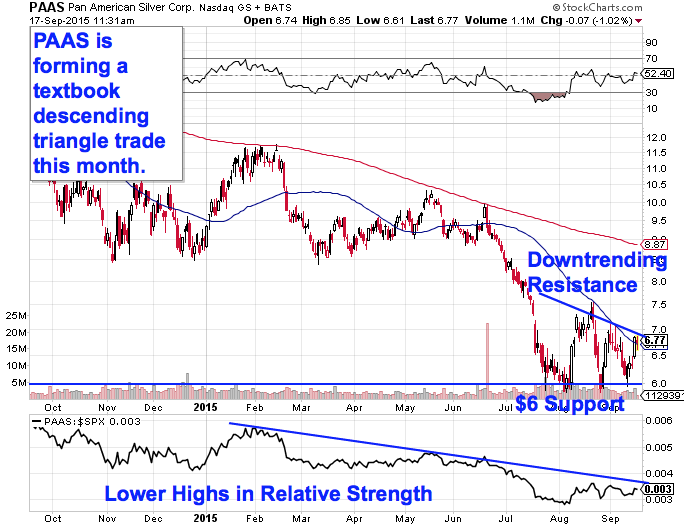 2015 has been a rough year for any commodity stock, and Pan American Silver (PAAS - Get Report) has been no exception. Pan American Silver has shed about a quarter of its market value since the start of 2015 -- and nearly half of its market cap if you zoom out to the full trailing 12 months. The problem for investors is that Pan American Silver may not be done selling off just yet. Pan American Silver is currently forming a descending triangle pattern, a bearish price setup that's formed by horizontal support down below shares at $6, and downtrending resistance to the top-side. Basically as this stock bounces in between those two technically-significant price levels, it's been getting squeezed closer and closer to a breakdown below our $6 price floor. When $6 gets violated, Pan American Silver is likely to see a second leg lower. Relative strength, which measures Pan American's price performance vs. the broad market, is the side indicator to watch here. The lower highs in our relative strength line tell us that this stock is still underperforming the S&P 500 right now. As long as that relative strength downtrend keeps pointing lower, this stock's price action should continue to lag as well. Caveat emptor. We're seeing the same setup in shares of mortgage investor Chimera Investment (CIM - Get Report) . Like Pan American Silver, Chimera is forming a descending triangle pattern right now. In this case, $13.50 is the line in the sand to watch. If it gets violated, then look out below. Why all of the significance at that $13.50 level? It all comes down to buyers and sellers. Price patterns, such as this descending triangle pattern in Chimera Investment Corp., are a good quick way to identify what's going on in the price action, but they're not the actual reason a stock is tradable. Instead, the "why" comes down to basic supply and demand for Chimera's shares. 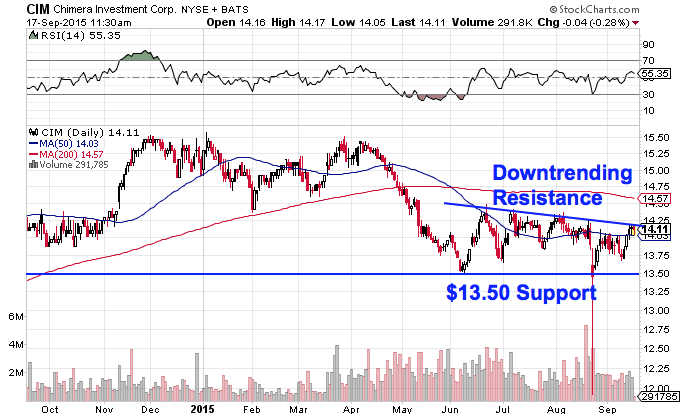 The $13.50 support level is a price where there has been an excess of demand for shares; in other words, it's a spot where buyers have previously been more eager to step in and buy than sellers have been to take gains. That's what makes a breakdown below $13.50 so significant -- the move means that sellers are finally strong enough to absorb all of the excess demand at that price level. Like with any breakout trade, it's important to be reactionary here; downside in Chimera doesn't become a high-probability trade until sellers are able to knock this stock below our $13.50 support level. Mumbai-based business services tock WNS Holdings (WNS - Get Report) has enjoyed a solid run in 2015. Since the calendar flipped to January, this $1.5 billion firm has seen its share price rally by more than 43%. But if you own shares, it might be time to think about taking some gains off the table. 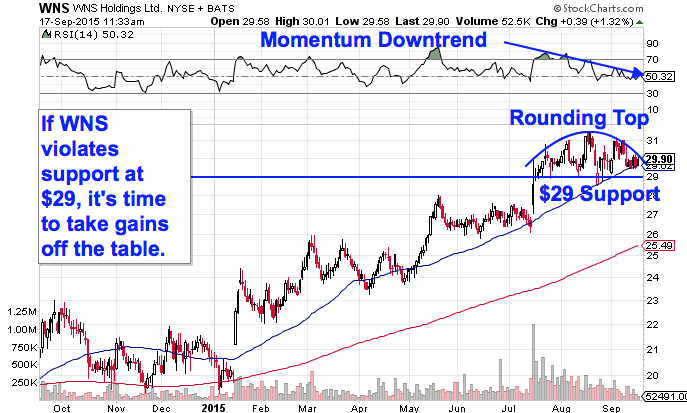 After rallying hard all year long, WNS is starting to look top-heavy. WNS is currently forming a rounding top, a bearish reversal pattern that looks just like it sounds. The rounding top indicates a gradual shift in control of shares from buyers to sellers -- and for WNS, the sell signal triggers on a violation of support at $29. Put another way, if shares slide below the $29 level, then we've got confirmation that sellers have taken the reigns of this stock, and the uptrend is in jeopardy. The side-indicator to watch right now in WNS is momentum. Our momentum gauge, 14-day RSI, has been rolling over, making lower highs as the rounding pattern progressed. That's an indication that down days are outpacing up days in this stock. Still, it's critical to only use price as the trade signal. If our $29 price tag gets violated, then WNS could see a material correction this fall. You really don't have to know much about $22 billion real estate investment trust Health Care REIT (HCN to know what it's about -- the name pretty much says it all. Likewise, you don't need to know much about technical analysis to figure out what's been going on in this stock lately, because the price action has been about as straightforward as it gets. And while shares popped on news that the Fed is postponing a rate hike, it's a mistake to buy this REIT right now. 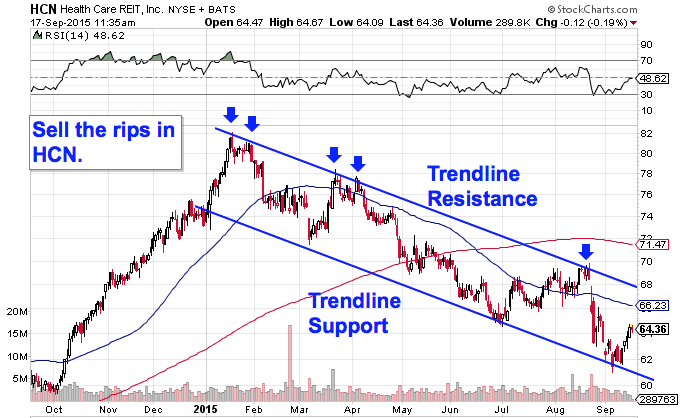 Health Care REIT has been bouncing its way lower in a well-defined downtrending channel, with shares moving lower every time this stock has hit its head on the top of that price range. In other words, every test of the top of this stock's price channel has been a great selling opportunity, and investors have seen five of them so far. So despite yesterday's 2.6% jump, it still makes sense to be a seller on the next bounce down. Waiting for that bounce lower before clicking "sell" is a critical part of risk management for two big reasons: It's the spot where prices are the highest within the channel, and alternatively it's the spot where you'll get the first indication that the downtrend is ending. Remember, all trend lines do eventually break, but by actually waiting for the bounce to happen first, you're confirming that sellers are still in control before you unload shares of Health Care REIT. Last up on our list is luxury eyewear stock Luxottica Group (LUX . Luxottica has basically been the opposite of Health Care REIT in 2015. Since last October, this stock has been moving straight up and to the right, climbing almost 50% higher in the process. But shares are starting to look "toppy" here too, and investors might want to think about taking some gains soon. Luxottica is showing off a classic head and shoulders top, a bearish reversal pattern that indicates exhaustion among buyers. The head and shoulders pattern is formed by two swing highs that top out at approximately the same level (the shoulders), separated by a higher high (the head). 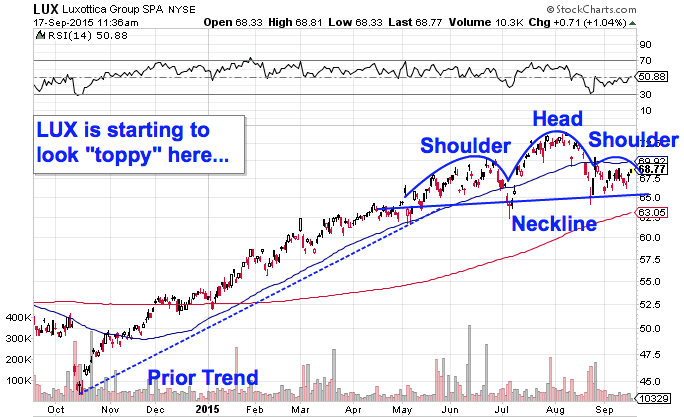 The sell signal comes on a move through Luxottica's neckline -- that's at the $65 price tag. If $65 gets violated, then Luxottica opens up considerable downside risk. Lest you think that the head and shoulders is too well known to be worth trading, the research suggests otherwise: a recent academic study conducted by the Federal Reserve Board of New York found that the results of 10,000 computer-simulated head-and-shoulders trades resulted in "profits [that] would have been both statistically and economically significant." That's a good reason to keep a close eye on Luxottica's $65 level here.